Bob Bates and Mike Verdu founded the Virginia-based Legend Entertainment Company in 1989. 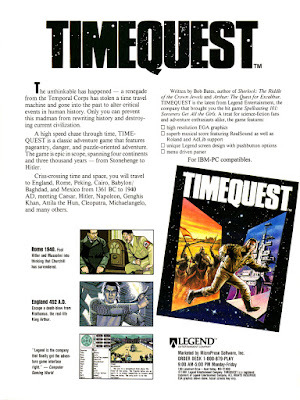 Legend released 15 adventure games games for home computers between 1990 and 1997. It also developed the strategy game Star Control 3 and first-person shooters Wheel of Time and Unreal: The Awakening. In 1998 the company was acquired by GT Interactive with GT then being purchased by Infogrames in 1999. Legend assisted with the development of Terminator 3: Rise of the Machines before being closed in 2004. Since I only have three ads for Legend I'm going to upload six more ads to the Electronic Arts album this week as well.